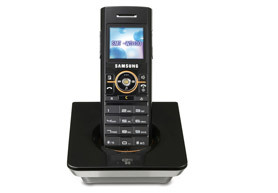 Samsung OfficeServ Wireless is redefining companys wireless communication. Samsung WLAN solution will liberate you from the four walls of your office and save costs with its ability to remove unnecessary cabling and maintenance through the qualified voice data service of IP and WLAN. Gain more control over your productivity with Samsungs wireless mobility solution. It starts with the new trim handset to a longer lasting battery source serving it, and added calling features usually expected in a cell phone. And the power is extended to an unlimited number of access points, supporting your coverage area. Professionals demanding productivity while on the move will appreciate the latest 802.11a/b/g technology, upgrading your handset performance and expectations in our wireless world.